Note: If you are looking for any other vineyards you can't find please contact us. We have been selling a small selection of South African wines for a number of years and recognised over a period of time, that not only quality but also popularity was on the increase. Having planned a visit for quite a while, September 1998 was the month we chose and off we went. What a lovely country with such beautiful wines across the southern part of South Africa. We feel at this stage we have to mention our friend Jake and his wife Jo , who are running a successful Restaurant called Jake's which is located in the High Street of Windsor. They helped us during our planning stage and contributed enormously, to make sure, that this trip was going to be a complete success . We started just outside Krueger Park in the Ulussaba Game Reserve and were lucky to see all the famous animals, except the Buffalo in the first three days of our journey and then we went straight down to Cape Town. From there we started our Wine Tasting tour across the total area of South Africa's Winelands and not once were we disappointed. We met famous winemakers like Paul de Wet of Zandvliet, Kevin Grant of Hamilton Russel, Francois Naude of L' Avenir, Herman Kirschbaum of Buitenverwachting, Walter Finlayson of Glen Carlou only to name few. Everybody had enough time to talk about the past, the present and their total commitment to experiment and try new ideas of improving winemaking and to make these wines available not only to the connoisseur but also bringing the wines to all people who like to enjoy a glass from South Africa . Towards the end of our pleasant journey, enhanced by everyone we met including some of Jake's friends decided to produce a special South African List in the UK. It was Jan van Riebeeck , Commander of the cape of Good Hope who wrote in his diary on February the 2nd in the year 1659 "Today praise be to God, wine was made for the first time from Cape grapes!" Three centuries later, this date again appears, as a red letter day, for it was on February the 2nd in the year 1990 Since that day, the South African wine industry has changed beyond all recognition; just as we have found it South African wines have become a serious contender already in the world of international wines. As mentioned above already, everybody in the South African wine industry is poised to make it a success in the years to come i.e. into the next century " A visit worthwhile." Van Riebeeck planted his first vines in the Dutch East India gardens in the year 1655 and the first wine was made from the harvested grapes in February 1659. Extended planting over an area of 100 hectares in Bosheuwel along the river Amstel now called Liesbeek, Cape wines were the first wines of the New World which became famous in the late 18th and early 19th century. The royal courts of Europe were great favourites of the sweet wines from Constantia and Napoleon Bonaparte requested one of those bottles on his deathbed. If his wish had been granted, he would have died a satisfied man. In modern times the wine industry did not come into it's own until the end of the 2nd world war. One of the most important factors has been the introduction and the perfection of cold fermentation techniques for white wine's towards the end of the 1950's. For the first time in two decades, wine sales are growing within South Africa and the export market is expanding all the time, i.e. 35% increase in the UK alone in the year 1997. The old properties have been revitalised and foreign investment has been pouring in. First Europeans arrive in the Cape in 1487 - grapevines planted in 1655- first wine harvested on the 2nd of February 1659 - 1679 Simon van der Stel is appointed governor and establishes the town of Stellenbosch and plants 100 000 vines in the year 1680. In 1688, 200 French Huguenots emigrate to the Cape and given land grants in the Franschhoek area - in 1761, Constantia exports red and white wine to Europe- 1795 British occupation of the Cape Colony - 1825 Cape wines boom in England since the English Government places heavy import duties on French wines - the phylloxera louse appears in the Cape wine land in 1885 and destroys the vineyards - re planting in 1904 - as over production has become a severe problem, the chairman of the Cape Wine Farmers Dr. Charles Kohler calls on the farmers to sell their wine through co-operatives and KWV was formed in 1918- in 1925 Professor Perold of the Stellenbosch University successfully crosses Pinot Noir of Burgundy with Cinsaut of the Rhone (known as Hermitage in the Cape), creating Pinotage , a grape variety which is unique to South Africa - Johann Grane the inventor of cold fermentation of white wines buys Nederburg in 1937 - in 1945 the Distillers Corporation is formed by Dr. Anton Rupert - W & A Gilbey is opening a distillery in Natal in the year 1950- in 1971 the Stellenbosch Wine Route is launched - After President de Klerk implements changes in 1992, that will lead to majority rule, sanctions are lifted and South African wines are on the move again. Since 1992 more classic grape varieties have been planted at the Cape winelands such as Chardonnay, Sauvignon Blanc and Merlot. Bukettraube (white): The variety reached the Cape around 30 years ago from Germany. It has adapted various climatic conditions. It grows in areas like Paarl, Tulbagh and Stellenbosch. Cape Riesling (white): No record of the arrival time and at a guess it could have been one or two centuries ago. It is thought to be Weisser or Rhine Riesling. It is traditionally called Cape Riesling but also known as South African Riesling in the Paarl area. Cabernet Franc (red): Since the 1980's planting has increased quite a lot and it is now found more often as a component of Bordeaux style blends and used mainly in the Stellenbosch area. Cabernet Sauvignon (red): There is no record of the arrival of Cabernet Sauvignon in South Africa but it is quite possible, that this variety is already in the Cape for two centuries. Producers planted a number of different Cabernet Sauvignon clones; the most popular are CS 46 and 163. Chardonnay (white): Chardonnay was first planted in South Africa in the early 1980's. Today there are more than 4000 hectares planted in the Cape winelands . The main regions are the Coastal area and the Breede River valley. Carignan (red): This variety is planted in small quantities by some 6 growers. This vine comes originally from the area of Carinena in Spain. Chenel (white): This was the first South African cross perfected after the Pinotage as well as the first white grape and released in 1974. Chenel is a combination of Chenin Blanc and Trebbiano and was produced by Professor Chris Orffer . Chenin Blanc (white): Chenin Blanc was probably introduced by Jan van Riebeeck . It is the most planted grape variety and covers some thing like close to 30 % . Chenin Blanc was called Steen until the mid 1960's . By 1965 it was established, that Steen was in actual fact the same grape variety as Chenin Blanc. Some producers still call their Chenin Blanc Steen. Walter Finlayson of Glen Carlou was one of the first taking Chenin Blanc more seriously by wooding his 1994 vintage. Cinsaut (red): Cinsaut was first planted during the mid 19th century . In 1980 almost 13 % of the Cape vineyards making it the most planted red variety but by 1995 this figure had dropped below 5%. Colombar (d) (white): Around 20 years ago Cape winemakers discovered, that Colombar could produce extremely pleasant drinking wines. Prior to that, this variety was used mainly for distillation purposes. Colombar thrives on a variety of soils, particularly high potential calcareous soils in warmer areas. Gewuerztraminer (white): Originally from the village Tramin in Tyrol - since the middle ages in Alsace and relatively new to South African vineyards. This variety was first planted around 20 years ago and its success is limited. Grenache Noir (red): Grenache Noir has been planted in small quantities in the Cape with some success. Kerner (white): Originally from Germany, Kerner made an immediate impression with its full flavours, good sugars and high acidity but the variety has failed to sustain a following. Malbec (red): The very limited plantings in the cape have done extremely well. Merlot (red): There has been a dramatic increase in the planting of Merlot in the districts of Stellenbosch and Paarl. New vineyards are also being developed along the west coast, where irrigation has to be carefully controlled in order to produce quality rather than quantity. Currently over 2000 hectares are planted to Merlot which represents just over 2 % of the total area planted vines. Muscat d'Alexandrie (white): One of the first grape variety at the Cape and it is thought to be the "Spaanse druyfen" to which Jan van Riebeeck referred to in his diary. Today, this is the fourth most planted grape variety in the cape with something like 6 % of total vineyard plantings. Most wines made from these grapes are not famous. Pinot Noir (red): Professor Perold originally imported Pinot Noir to South Africa on the Swiss BK5 clone. These vines are prone to leaf roll but the problem has largely been overcome since the introduction of new clones. Pinotage (red): The best quality grapes are grown on bush vines with a total yield of no more than 7 tons per hectare. 3 % of the total vineyard plantings account for Pinotage. Roobernet (red): Developed by Professor Chris Orffer and are "offspring" from the parents Cabernet Sauvignon and Pontac. The juice of Roobernet is as dark as Pontac and the wines have deep colour and do not need long skin contact. The wines are not too tannic and therefore easily accessible. Roobernet wines have a distinctive Cabernet Sauvignon character and are bottled under the Roobernet label. Will be available at the turn of the century. Ruby Cabernet (red): First planted in 1982 and has done very well in the Cape. It produces four times more per hectare than Cabernet Sauvignon. Mainly planted in the Worcester area. Sauvignon Blanc (white): Extensively planted at the beginning of the 20th Century, Sauvignon Blanc vines were uprooted in the 1940's because of poor plant material. Replanting started in the late 1970's. By the mid 1990's the planted area had grown to 4.5 % and increases annually. Most of the Sauvignon Blanc can be found in the Coastal and Breede River valley region. Semillon (white): Semillon is considered to be one of the first grape varieties brought from Europe to the Cape where it used to be known as the "Green Grape" or "Groendruif". For most of the 19th Century it was the most planted grape variety representing more than 90 % of the total plantings. By 1995 however it had dropped to just over 1 % but seems to be gradually regaining popularity. Souzao (white): There are small plantings of Souzao mainly in Paarl, Stellenbosch and the Swartland. The wines from this variety are so deep in colour, that they appear almost black. Souzao produces very complex, mouth-filling wine with excellent maturation potential and if not used for port production, it is blended into red natural table wines. Shiraz (red): Shiraz has the history of producing good quality wine. Popularity was limited and producers were not rewarded for quality as is the case today. The Shiraz plant material was also virus infected in the earlier days but this has now been corrected. Most of the Shiraz will be found in Paarl, Stellenbosch and Swartland. Tinta Barocca (red): Tinta Barocca was originally planted for port production, although over the years some varietal wines have been bottled. Viognier (white): Viognier has taken a long time to reach South Africa. It comes from France and is planted in Australia and California. There are now small plantings in the districts of Paarl and Stellenbosch with at least eight producers planning to plant as soon as material will be available. 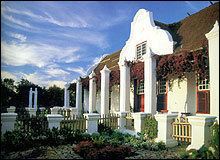 Zinfandel (white): Since the late 1970's small plantings of Zinfandel are found in the Stellenbosch District. 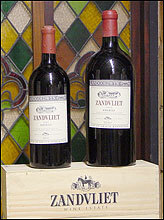 There are three red wines bottled under the Zinfandel label, of which Blaauwklippen's is the oldest. Weisser Riesling (white): Dr. Hans Ambrosi, a German, worked as a consultant at ARC - Nietvoorbij and recommended to import a number of Riesling clones from Germany to evaluate these under South African conditions. This was realised in the 1960's. Results were promising and the variety was released for planting in 1974. It now accounts for something like 1 % and can mainly be found in the Coastal region. September, October and November are the months of Spring in the Cape vineyards, a sensitive time annual cycle. Severe spring frost may injure young shoots or strong winds could influence pollination during blossoming or flowering time can lead to poor berry set ("Millerandage"). In summer, during December, January and February, the vine has a steady supply of warmth, that is essential during the growing season. Heat and sunlight are needed to create the necessary photosynthesis that produces sugar in the grapes. Without adequate sunshine the sugar content is low, resulting in a light wine, high in acid and low in alcohol. On the other hand, problems can arise in a climate with too much sunshine. If the climate is very hot, the aromatic quality of grapes, with the exception of Muscat flavours, are not as delicate or rich as those which develop in more temperature conditions. A high rate of photosynthesis results in high sugar content in comparison to fruit acid production and this yields an unbalanced wine. The same role is played by the wind and this is very important, since the effect of summer heat is cooled by the cooling breezes from the sea and many of the Cape's wine areas can be reached by these. When protected by a mountain or valley, natural conditions prevail for the making of fine wine with a high fruit acid content and well balanced sugar. During the growing season, the ideal water supply to the vine is approx. 300 to 350 millimetres. Too much water can be harmful resulting in soft cell structures in the plants and fruit and lead easily to rot. Heavy falls of rain when grapes have reached their optimum ripeness can cause berries to split and rot. The sugar will decline at the same time and dilution of the berry juice takes place. The autumns months March, April and May bring lot of activities to the vineyard like harvesting the late ripening, build up reserves for the next season, cover crops are planted and by May, if the leaves have fallen, pruning is going to start with the removal of all unwanted growth. Canes are selected and left for the final pruning at the end of winter. South Africa produces the whole spectrum of red and white wines, good quality Sparkling Wines using the Methode Champenoise Tradition as well as Cap Classic styles. Rose and natural sweet wines, Fortified wines Cape Sherry, Cape Port, Muscadel, Brandy etc. RI - Wine of Ascot We are proud to have produced such a comprehensive list covering the whole of the South African wine regions and are grateful for all the support from the vineyards, the owners, the winemakers, the shippers to name but a few. Reference John Platter, Wine of the Cape, Hugh Johnson, Mitchell Beazley , Sotheby's World Wine Encyclopedia Literature from Vineyards, Suppliers and Shippers. If you are looking for something specific, please don't hesitate to contact us.